Orientalis Hawthorn (Crataegus orientalis) is an attractive, spreading hawthorn tree with grey flaking bark and glossy green, deeply cut leaves, grey-green downy beneath. When we say deeply cut, this is a horticultural term, not the results of us sending out the new guy with a pair of scissors and a pattern. It carries dense clusters of single white flowers. Attractive, large orange-red fruits are produced. Leaves remain fresh well into the autumn. 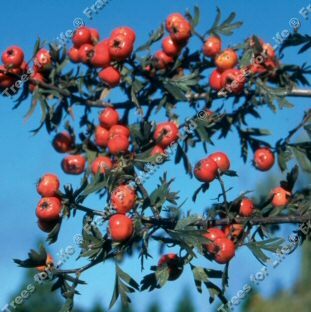 This tree is supplied at a height of between 1.5 and 2.0 metres in a 10-15 litre container for year round planting and better results than from either bare-root or rootballed stock.